Your recycle, compost, and garbage collection day will change during the holidays. Collection will not occur on Christmas and New Year’s Day. If your regular collection day falls on or after one of these holidays, your collection day will be moved to the following day for the rest of the week. 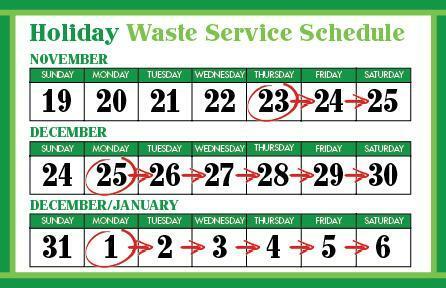 For more information about holiday schedule changes for waste collection, HHW Station hours, and street sweeping, visit http://www.cityofpaloalto.org/gov/depts/pwd/zerowaste/news/details.asp?NewsID=879 You can also email zerowaste@cityofpaloalto.org or call (650) 496-5910. For the four weeks following Christmas day, holiday trees will be collected curbside. Trees must be undecorated, unflocked, cut to four-foot lengths with stands removed, and placed curbside next to your compost cart. GOT LOTS OF CARDBOARD BOXES? Cardboard boxes and packaging materials that are not properly prepared can cause litter that negatively impacts our streets and creeks, as well as costly inefficiencies in our waste collection system. 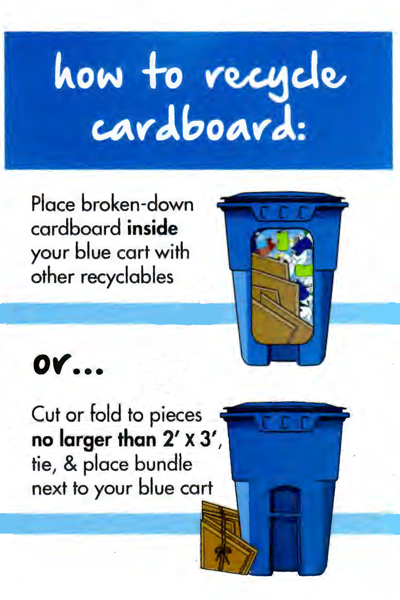 If you consistently have a lot of cardboard, you can get a larger or additional blue recycle cart by contacting GreenWaste of Palo Alto at pacustomerservice@greenwaste.com or (650) 493-4894. For more information about What Goes Where, visit www.cityofpaloalto.org/wgwtools, email zerowaste@cityofpaloalto.org or call (650) 496-5910. Happy Holidays – Package Thefts are on the Rise How old is YOUR water heater?